Conductive vs Dissipative: Does It Matter? by Kenneth P. Jaworski P.E. Usually in life, we think of flexibility as being good. And it often is, in HVAC and elsewhere. However, if you don't pay sufficient attention to motor and impeller details before you decide to invest in VSDs, you could be pumping up your costs and draining your efficiency. See how a careful evaluation and new system curve put one data center on track for a leaner budget. FIGURE 1. Orignial design selection. Commissioning and testing has been a core component of the consulting and design work developed at JDA Consulting Engineers since 1990. 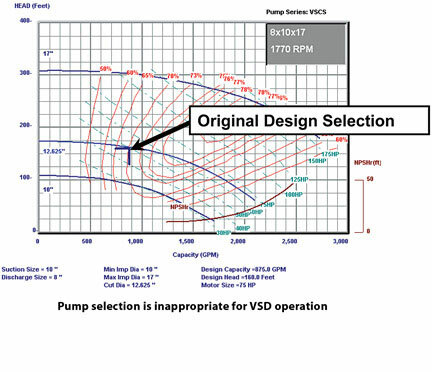 Our firm's experience suggests that VSD technology has become a panacea for solving the complex design issues that relate to centrifugal pump selection. As JDA's team commissions large, complex mechanical plants, we find more systems where the VSD is practically abandoned in place. Rather than providing the precise control of flow and pressure or reducing energy consumption and demand, the VSDs appear to be "stuck" at a single speed. The economic consequences can be substantial. Consider that every VSD requires mounting and wiring work by the electrician, installation of differential pressure controls, and programming provided by the automation contractor. VSDs in the range of 10 hp to 100 hp can cost $150/hp for the drive and an additional $60/hp for the installation. These costs exclude automation and monitoring of the drive system, budgeted to be $4,000 more. Thus, a 75-hp VSD installation can cost almost $20,000, which could be more than the cost of the pump installation! There better be a large energy savings, or the owner will never realize a payback for the VSD investment. Additionally, VSDs require maintenance, repair, and replacement over their life cycle. If they never cost-effectively saved energy, the owner is paying for multiple line-item costs when none of them was needed in the first place. For example, on a recent data center project (process cooling environment), JDA were commissioning the design and found 75-hp pumps selected to operate with VSDs. A 75-hp pump operating continuously (8,765 hours/yr) at full load will consume approximately 493,000 kWh. In the selection, the motor was 94.5% efficient, and the impeller selection was 70% (Figure 1). The original design point for the selection was a 160-ft head (hd) at 875 gpm, on the 1,770-rpm pump motor. The design point on this selection required a 75-hp motor to accommodate a "non-overloading" selection. However, at 875 gpm the motor would only require 50 hp. Thus, a 75-hp VSD would be required to match the motor, even if the motor load remained at less than 50 hp over its life. Immediately, the 75-hp VSD on a 50-hp application loses some of the potential economic benefit. At $0.11/kWh, the annual cost to operate the 50-hp pump load will be approximately $36,160 annually. It is interesting to note that the initial design selection requires the pump to operate at full speed (1,770 rpm) to maintain the required head pressure. Since the VSD inefficiency loses at least 5% of the power, the cost of operating the pump, with the VSD at full-speed, increases to $37,968. Thus, the motor would cost less to operate without the VSD. 1,770-rpm pumps (75 hp) are inappropriate for this plant. The pump impeller is inefficient at the selected conditions (70%). A VSD is not required for this constant-load, operating independent of weather. 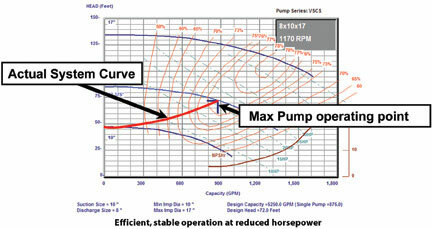 Pump curves do not match system curves, resulting in unstable operation. 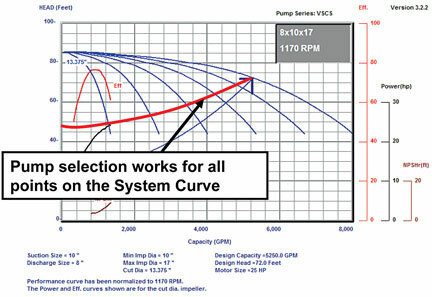 Developing a system curve for the new pump recommendation required the load information found in Table 1. The friction losses found in Table 2 and 3 were calculated for the fully loaded mechanical piping system. Note that while the system has diversity, an individual AHU coil, control valve, and branch piping must always have a minimum chilled water differential pressure to support critical computer loads. The system curve was plotted in Figure 2. Note that the actual head pressure requirements are less than originally specified. The original pump design point of 875 gpm at 160 ft hd only required 875 gpm at 72 ft hd. Horsepower requirements were reduced to approximately 21 bhp, using a 25-hp motor. FIGURE 2. New system curve. One significant finding was the pump efficiency improvement (70% to 76.2%) created by operating the pump with a slower rpm motor (1,170 rpm). Operating this new selection continuously would cost approximately $15,946 annually — a savings of $22,022/yr/pump. Note the absence of the VSD. FIGURE 3. New SCHW pump selection. The data center needed capacity to grow and the recommendation was to bring on additional, smaller pumps as the load grew. The original design had banks of six 75-hp pumps, all operating with VSDs. JDA developed a parallel-pumping performance curve, shown in Figure 4. In this scenario, smaller pumps, still in banks of six, are staged to maintain flow and differential pressure. At full system load, the initial cost savings for the smaller pumps without VSDs exceeded $150,000, and annual utility savings were projected to be over $130,000 annually. FIGURE 4. Parallel operation of new selection (1,170 rpm). 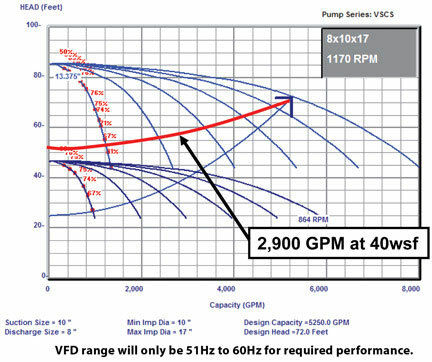 Figure 5 displays that adjusting the new pump speeds to track the load actually degrades performance. If the load drops 15% and the pumps are allowed to operate at full speed, only three pumps are required. The centrifugal pumps will build up head pressure and flow will vary proportionately. Conversely, if VSDs are used to slow the pumps down 15%, then additional pumps will be required, as the impellers operating at a slower speed are less efficient. Incredibly, using VSDs to track the load adds construction costs and increases utility and maintenance costs. FIGURE 5. Low-speed pump performance is degraded with a VSD. In Figure 6, the new pumps are operated at 74% speed (864 rpm) and they cannot maintain sufficient head pressure to maintain the operation of the chilled water coils. Since the minimum speed of any centrifugal pump must be that required to maintain head pressure, VSDs, if applied in this example, would only modulate from 51 Hz (85%) to 60 Hz (100%). An owner's operator would tend to think the VSD was stuck in one position. FIGURE 6. At 74% speed (864 rpm), pumps cannot maintain sufficient pressure. Proper analysis and application of centrifugal pumps may lead the designer to eliminate VSDs. In this real-world example, parallel 1,150-rpm (25 hp) pumps provided excellent performance. The system is simple and intuitively operable. Complex VFDs and controls were eliminated. The construction schedule and budget got shorter and smaller, respectively. Utility and maintenance costs declined substantially. And variable-speed operation of parallel pumps was unnecessary. If it can be shown that the heating or cooling load varies significantly over a period of time, then applying a VSD could be economical. The correct pump must be selected, however. 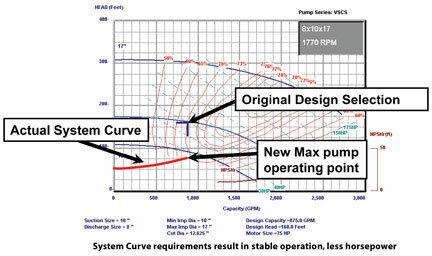 A pump that exhibits a steep curve suitable to the diversity of the load through a range of hp requirements to maximize operating cost savings should be chosen. Perform a simple payback analysis to justify the application. 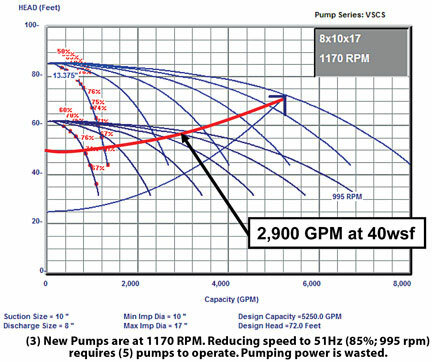 JDA strongly recommends having the pump vendor supply curves for the pump selection in 20- rpm increments: 1,770, 1,570, 1,370, etc. With the variety of curves, a mechanical designer can determine the pump efficiency, actual motor hp, and true operating benefits. SDs can also be applied to increase the reliability of a critical system or process through passive redundant control. In this application, two or more pumps operate in a parallel scheme under the control of dedicated VSDs. If one of the pumps fails, the other will automatically ramp up to the required system requirements without the initiation or action of any other control element. The obvious elimination of single points of failure increases the overall reliability of the process. Another critical system application for VSD technology includes large mechanical loads that must be started on engine-generator power. Without VSDs, across-the-line inrush current can overload the engine-generator. Soft starting with a VSD allows the mechanical load to start with a minimum of inrush. The generators can be smaller and will generally be more reliable. R&D facilities, pilot plants, and other applications can benefit from VSDs to improve process control. Additionally, R&D loads can be highly variable and VSDs can assist the enduser "dial up" more capacity. They are widely used in industry for precise speed control of conveyors and printing presses. Ultimately, optimization of economics or system reliability results from the use of VSDs. Koplin is the president of JDA Consulting Engineers in Baltimore. He has over 30 years of experience designing and testing complex central plants and has pioneered advances in mission-critical design. System reliability and operability is enhanced though integrated commissioning of each project. Jaworski is a senior mechanical engineer with JDA Consulting Engineers in Baltimore. He has over 30 years of experience designing and commissioning boiler and chiller plants, refrigeration plants, HVAC, fire protection, process piping, and materials handling systems. He currently specializes in the planning, design, construction administration, and commissioning of complex mechanical and electrical systems for mission critical facilities. His extensive experience also includes facility assessments, economic and energy analyses, life cycle costs, and optimization studies for mechanical systems.